“To address the whole culture of silence in Church is vital,” writes the Archbishop of Canterbury Justin Welby in the Church of England Newspaper, “it is a form of abuse,” he adds, mindful of the church’s past reluctance to respond to allegations of child sexual abuse and its manifest failure to protect the vulnerable from predatory paederasts who abuse their sacred positions of authority and trust. Innocence is destroyed and faith is lost. In order to ensure that it can never happen again, and by way of an attempt to right a few heinous wrongs, the church has put in place stringent preventative measures. ‘Suffer little children to come unto me, and forbid them not: for of such is the kingdom of God‘ (Lk 18:16). ‘It were better for him that a millstone were hanged about his neck, and he cast into the sea, than that he should offend one of these little ones‘ (17:2). All of which is noble, right and just. But what of the accused? Should they be kept from Jesus? Should they be denied a thousand years of refined justice? Contemporary changes in legislation combined with a certain media obsession have had a profound effect on prevailing practice and institutional attitudes. No corroborative evidence is needed now for prosecution of historical sexual abuse. There is an ‘always believe the victim’ attitude, as we have see in the case of Bishop George Bell. “Arrest first and investigate later,” directs the head of the National Crime Agency Lynn Owens. And the accuser is legally assured of anonymity for life, which is convenient if you’ve made it all up. The possibility of generous compensation is an undoubted incentive for false accusation (as can be primordial revenge, or psychological causes such as false memory, attention-seeking or other mental illness). The Church of England requires a risk assessment to be carried out and a safety agreement to be implemented for all those accused of sexual abuse. The only exception to this is if the allegation is malicious or unfounded, but there is no explanation as to how either of these particular outcomes may be ascertained. If the allegation has gone to the police, which it will often do, it can only be dropped if there is deemed to be ‘insufficient evidence’ to prosecute. As Sir Cliff Richard has discovered, ‘insufficient evidence’ is not a judgment of innocence, and mud sticks. While the Crown Prosecution Service may determine there is no case to answer, the Church of England appears to work on the assumption that ‘insufficient evidence’ means there remains sufficient evidence to proceed with both risk assessment and safety agreement. Further information could be obtained from public bodies such as the CPS or police to help the church make an informed decision of innocence, but this doesn’t appear to happen in practice (and there is no indication in their Guidelines that it should). And an allegation is rarely, if ever, investigated for malice, or the accuser prosecuted for malicious allegation. It is almost impossible to prove that an allegation of historical sexual abuse is unfounded. Every accused may therefore assume that they will have to have a safety agreement in place even if the CPS determines that no further action is necessary. But the Church is not a safe place for all. For the innocent victims of false accusations, the only route back into their church is fraught with anxiety and imposed shame. For those already suffering the trauma of a false allegation, and possible arrest, the Church is neither welcoming nor safe. The implementation of a safety agreement means that clergy, churchwardens and safeguarding representative of the church attended by the accused are all informed. The innocent who are falsely or wrongly accused fear that to sign a safety agreement may be wrongly interpreted as a confession to the abuse, somewhat akin to accepting a police caution. For many who suffer from being falsely accused, their situation has not been made public. They need protection. They do not want further shame and fear when they are in need of, and hoping for, support from their church. Their lives might even be in danger if such information about them is disseminated. The current climate is not sympathetic towards those accused of such crimes, and some innocent people have suffered appalling acts of violence. In the zealous forging of a safe space for all God’s children, the Church is ceasing to be any kind of space at all for the innocent victims of false accusations. There is no place for them to tell their story, and no-one particularly cares to listen to it. If the innocent accused attends a church in the diocese without a safety agreement in place, the Guidelines (5:19) state that “a wider circle” of people may be informed. The exact people and numbers are not stipulated. This constitutes a manifest threat to those wrongly accused and adds further to the sense of fear associated with church. This is far from being “compassionate and attentive” to the innocent victims of false accusations who have themselves been “abused and sinned against” twice – once by the false accuser, and now by the church. In some (if not many) cases, the innocent victim of false accusation is provided with no pastoral support. For these people the church is not “attentive to their pastoral care” and appears cruel beyond belief. They are now the members of the Church family “not listened to”. If you have had an allegation of sexual abuse made against you, the church informs you that you are unable to worship anywhere in your diocese without a separate safety agreement in place for any church attended. If you cannot accept the imposition of a safety agreement, you are effectively excommunicated. There is no alternative. Is the Church of England not thereby responsible for “keeping them from Jesus”? The Guidelines (2:8) state that the risk assessment should be evidence-based, compiled by those with no bias or connections, and should always collect and take into account relevant information from all statutory agencies involved (5:4). However, at least one diocese takes the view that “the risk assessment is not a process to determine guilt or innocence. It is not our remit.” No information was sought from a professional body involved nor the reasons given by the CPS for ‘no further action’. Section 5:12 of the Guidelines stipulates that the individual’s relevant background history should be taken into account. This is not always done. The result is that innocent people of upright character are perceived and treated as though they are guilty. Astonishingly, there is no right of appeal, since “appeals cannot be made against the assessment conclusions and recommendations, which stand as the assessor’s opinion and cannot be challenged as such” (5.35). That is a fundamental denial of natural justice. Damned by an “assessor’s opinion” with no hope of redemption is not a channel for fellowship or communion. How can it be, when a safety agreement must effectively be in situ for life, and carried out again and again if the accused seeks out an alternative church (and what innocent soul wouldn’t?). As each “wider circle” of people is informed of the accused’s presence among them, the church taints their names and destroys their reputations in perpetuity. The “assessor’s opinion” is untouchable, immutable, infallible. This isn’t a hypothetical injustice: this Kafkaesque corruption of divine justice is happening now. One only has to consider the appalling case of Sister Frances Dominica to realise that a false allegation of child abuse can have devastating effects on the accused. Sister Frances would have preferred her case to have gone to court in order that her guilt or innocence might have been established beyond doubt. Yet here she is, trapped in cyclical years of depression, shunned by her peers, unable to fathom why the Common Law and Human Rights Act both assert the presumption of innocence but it does not seem to apply to her. Sister Frances is by no means alone: consider the Oxford University report ‘The Impact of Being Wrongly Accused of Abuse in Occupations of Trust: Victims’ Voices‘. 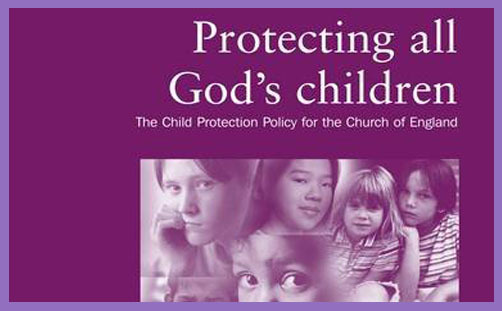 It ought to be compulsory reading for all bishops and other assessors of risk and safety in the realm of allegations of child abuse. In their reluctance to take responsibility for making decisions to determine innocence, the Church of England is creating a new class of abused people – abused not by individuals, but by the institution of the Church itself, alienating and expelling them from the family of God, and denying them the natural interchange of fellowship and spiritual life. It is a heinous evil to turn a blind eye to child abuse. It is a grievous infraction to deny justice, pastoral care and comfort to those in reputational limbo. Germans stockpiling food and water? What do they know that we don't?